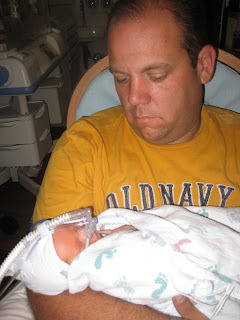 The Musings of a NICU Mommy: Five days old already!! Hannah is still hanging in there. 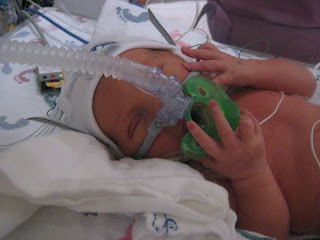 She remains on the CPAP but they have lowered her pressure just a little bit. 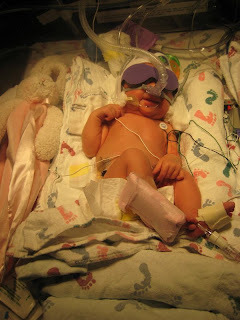 She is now needing around 35% oxygen to keep her oxygen saturation up. She has been fed 3 times and is tolerating her feedings. 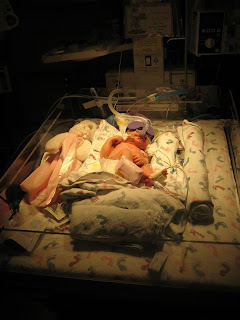 Hannah was moved to an isolette this morning and is still under the bili lights. 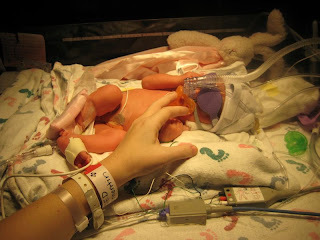 She now weighs 5 lbs 2 oz. She only lost a few grams from the day before so maybe she won't loose too much more. Our whole family is going to visit her this morning before we go to the pumpkin patch. Can't wait to hold her and kiss my little one. 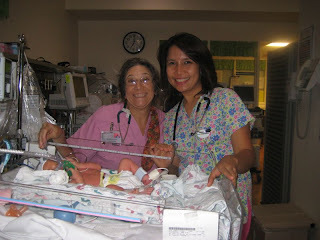 Here are some pictures of the nurses taking care of Hannah. It is really nice having all my friends take care of her. She gets special treatment and lots of prayers from them. I LOVE all of the new pictures. 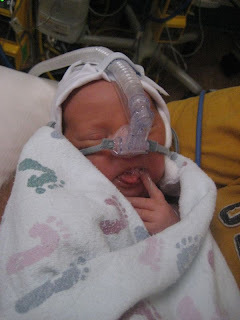 The one of Hannah with her finger in her mouth is so cute. I also love how big the pacifier is on her face. Thanks for posting. Have fun at the pumpkin patch. Hannah is so cute. We're still praying for all of you. Have a wonderful day at the pumpkin patch! Ahhh...love these pictures. 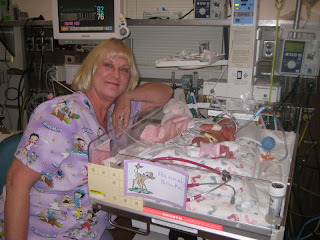 It must be such a blessing to know those nurses who are taking care of her so well. 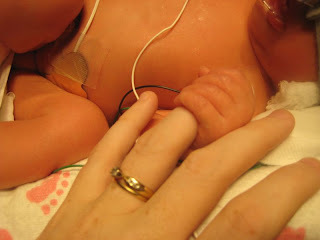 Love the pictures - I especially like the one of her holding your hand and her "sunning" :):) She is a cutie! I am with Julie - what a HUGE blessing to know who is taking care of Hannah!